Our 2nd Anniversary is gearing up to be a top notch, high flying celebration! Civilian pilot Jon Melby will perform in his Hangar 24 Muscle Bi-Plane, while Vicky Benzing, the fastest female to ever qualify at the Reno Air Races, will perform, as will Kent Pietsch in his Jelly Belly Interstate Cadet. Bill Braack will roar down the runway in his Smoke-n-Thunder JetCar, capable of reaching speeds of 400 mph, while Greg Colyer will thrill you in his vintage jet! Lots more to be announced, stay tuned to this page to get to know the stars of the show! The Warthog is a fierce animal. Tough and built for combat. Just like the mighty A-10. Hated by America’s enemies. Loved by anyone that is under the threat of enemy fire. The A-10 supports ground troops like no other attack aircraft. Built around its massive 30 mm Gatling cannon, “the Hawg” can carry 8 tons of weapons on its wings, which it delivers with pin-point accuracy on those that dare threaten American interests. We’re talking “warheads on foreheads”! Air Combat Command’s A-10 Demonstration Team is based in Tucson, AZ. Led by pilot Capt Cody “ShIV” Wilton, they will take to the skies over Lake Havasu and demonstrate the professional qualities of your United States Air Force in a show of close-air support capabilities provided by this unique and deadly combat aircraft. Come to AirFest and see why the A-10 continues to make a difference on the battlefield today. When it comes to super-aggressive, tear-up-the-sky aerobatics, nothing says “extreme” better than Hangar 24’s very own Jon Melby! Flying the Hangar 24 Muscle Bi-Plane, Jon is back for our 2nd Hangar 24 AirFest… and he plans to get even wilder in the skies over Havasu this year! With over 20 years as an aerobatic pilot, Jon is the master at wringing PERFORMANCE out of his 350-horsepower aircraft, and he will pull over 8G’s positive and 4G’s negative during his routine… that’s more G’s than the F-35 can pull! An Air Force veteran who flew classified special operations missions on the MC-130, Jon is an outgoing people-person, and we are proud to have him back on the Hangar 24 Team for 2018. “Ridiculously insane!”. That’s an apt description. Until you’ve seen this act in person, it’s really hard to believe a pilot can make a helicopter do this. Meet Aaron Fitzgerald. He’s the pilot. He really does this. He’s broken world records, and flies as a stunt pilot in Hollywood, and has flown flight test projects for NASA and the defense industry. He’s sane… but the routine he flies... well… not so much. 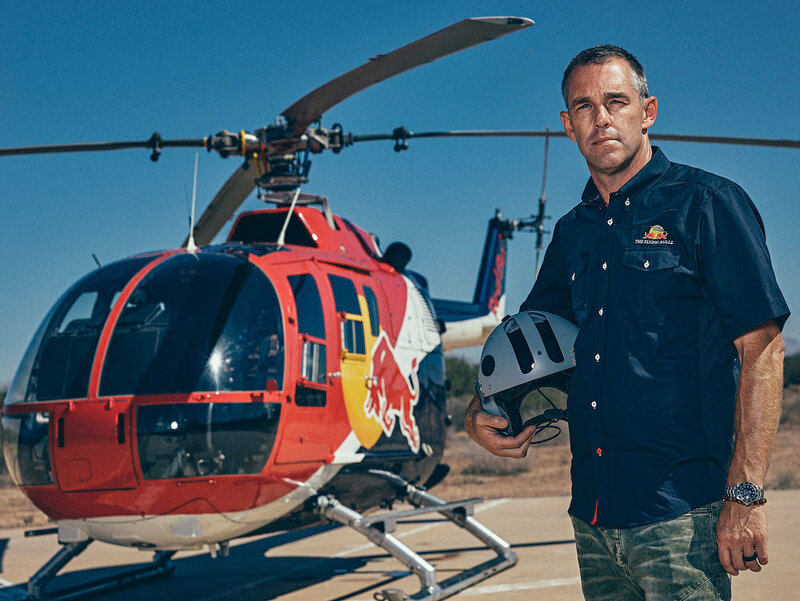 Meet the Red Bull Bo 105 helicopter. It’s pretty special. If you saw the James Bond movie “Spectre”, then you saw this helicopter in action. Hard to believe, right? Seeing is believing… but only if you’re at the Hangar 24 AirFest. Let’s face it… jets are cool!! And the AirFest line up will bring you a vintage aircraft from the 1950’s that was critical to transitioning our military from WWII propellers to the modern Jet Age: the Lockheed T-33 Shooting Star! Greg Colyer and his jet that he named “Ace Maker” will throw down the noise and speed that makes AirFest the exciting show that it is! Greg retired as an Air Traffic Controller, and is now a full-time airshow performer with a 2018 schedule that goes coast-to-coast, and includes Redlands… AND Hangar 24’s Lake Havasu AirFest this October! A two-seat version of the Korean War’s F-80 fighter jet, the T-33 trained some of America’s earliest jet aviators, and flew in the USAF until the late 1980’s. As an AirFest guest, you will get to see this beautiful and historic aircraft rip through the skies over the Inland Empire in a tribute to our veterans from days gone by. On the mic again after a stellar performance at the inaugural Havasu AirFest in 2017 will be Jon "Huggy" Huggins. No stranger to airshows, Huggy has spent his ‘spare’ time the past 30+ years hanging around airshows as a flying performer, static display, and all-around aircraft bum. His interests include not only the popular civilian and military airplanes currently on the airshow circuit, but also the many spectacular classic warbirds and experimental aircraft flying today. In 2007 he put his knowledge to use and started announcing airshows on the West Coast – receiving great reviews from the general public and seasoned performers alike. Huggy is a former Air Force pilot with over 7000 military pilot hours and 4100 flights. He was only the 4th person in history to achieve 2500 hours in the U-2 while on active duty and has had the opportunity to fly over 100 different military and civilian aircraft. As an aviation enthusiast, Huggy enjoys learning the history of just about anything aviation related, and loves to hear the personal stories of all pilots, famous or not. The breadth and depth of his aviation knowledge comes out on the microphone, and gives the crowd a unique insight to the spectacle in front of them. The AirFest “Air Boss” is person that is the “conductor and choreographer” of the entire day of performances. With 2018 being his 43rd year producing, managing, and running airshows, Ralph brings his unique knowledge and professionalism to Hangar 24, and ensures the event will be as spectacular as it is safe. With a flying resume that is simply too long to describe, he has an unlimited piston-powered letter from the FAA; founded the Texas Aviation Hall of Fame; was a former Executive Director of the Commemorative Air Force; and former Director of the Lone Star Flight Museum. Since he will be directing the AirFest activities from start to finish, you won’t see much of Ralph during the show… but you’ll definitely see the fruit of his labor! The Boeing C-17 Globemaster is a large military transport aircraft. It was developed for the United States Air Force (USAF) from the 1980s to the early 1990s by McDonnell Douglas. The C-17 carries forward the name of two previous piston-engined military cargo aircraft, the Douglas C-74 Globemaster and the Douglas C-124 Globemaster II. The C-17 commonly performs tactical and strategic airlift missions, transporting troops and cargo throughout the world; additional roles include medical evacuation and airdrop duties. Hangar 24 is honored to have been selected by the US Air Force for the incredible “Heritage Flight Formation Demonstration”. Only ~50 of these will be flown in 2018 throughout the United States. The formation pairs an Air Force front-line fighter/attack aircraft with an historic aircraft from WWII, Korea, or Vietnam. It serves as a living memorial to the men and women who have served—or are currently serving—in the U.S. Air Force, and Heritage Flight proudly flies in support of Air Force recruiting and retention efforts, while educating the general public on the importance of the U.S. Air Force and its mission. Noted warbird pilot Steve Hinton will fly the P-51 Mustang in the Heritage Flight, paired with the A-10 flown by Demonstration Pilot, Capt Cody Wilton. You definitely want to see this rare, historic, and extremely moving formation. The National Anthem fly-by will be performed by a 2-ship F/A-18 Super Hornet formation led by Justin “Scraps” Grofik. You will surely feel the ‘MERICA! The Boeing F/A-18 Super Hornet is a twin-engine, carrier-capable, multirole fighter aircraft variants based on the McDonnell Douglas F/A-18 Hornet. Bringing the sound and the fury of a 450 horsepower, super-charged Bull Stearman bi-plane looping and rolling over the Hangar 24 AirFest, Vicky Benzing will be flying her 9th consecutive Hangar 24 AirFest appearance… 7 in Redlands and two in Havasu!! “Aviation” is her passion… and she is an accomplished skydiver, back-country pilot, helicopter pilot, competition aerobatic pilot… and flying in a rare L-139 military jet, she became the fastest woman to ever fly in the Reno National Air Races at nearly 500 mph! Vicky’s 1940 Stearman is highly-modified from its original 220-horsepower engine. If you’re not familiar with the Stearman bi-plane, just take a look at a bottle of Hangar 24 Amarillo Pale Ale! The Red Eagles Formation Team is the only warbird formation aerobatics team on the West Coast and one of only a handful in the whole of North America. A premier team based in Southern California, they are a sight to see! Quite possibly the most recognizable civilian airshow performer in North America, Kent Pietsch returns to Lake Havasu! Known as “The Jelly Belly guy”, Kent’s unbelievable flying skills will leave you mesmerized during each of the three VERY different acts that he does: a comedy act; a truck-top landing; and an aerobatic performance… with the engine turned off! With over 40 years as an airshow performer, Kent has received every major award from the Airshow Industry, and is also an Honorary Member of the Royal Canadian Snowbirds Demonstration Team. His Jelly Belly-sponsored 1942 Interstate Cadet weighs in at 800 pounds, and only has 90 horsepower… but you simply will not believe what he does with that airplane! Kent performs throughout North America, Australia and elsewhere, and Hangar 24 is trilled to bring this world-class aviator and entertainer to our AirFest lineup! A distinguished veteran, Bill retired from the military after a 20-year career in the US Air Force Reserves, where he served as Loadmaster on the C-141 and C-130 aircraft, and accumulated over 2,700 flight hours, and 150 hours of combat time. Bill has a bit of rivalry going with one of our aerial performers, and we are expecting that it will culminate in a jet car versus airplane drag race before the day is over! You don’t want to miss this!! Hayden Proffitt II is the grandson of legendary hall of fame drag racer Hayden Proffitt, who was a 4 time national champion in NHRA and a 2 time national champion in AHRA. Also his uncle, Brad Proffitt, son of Hayden Proffitt, piloted the USA rocket 1 dragster, that’s right a rocket powered dragster which ran off of hydrogen peroxide. The USA rocket 1 dragster actually held the ¼ mile E.T and speed record at 4.355 seconds and 349.77MPH in 1978 and what’s more awe inspiring is the fact that the car was only running at 70% power. So you can see that the need to go fast is clearly in his genes. Come see him fly this truck down the runway at eye watering speeds! During the show we’ll have an assortment of WWII to modern warbirds on parade in the sky and parked on the “Ramp” for your viewing pleasure. You can expect to see the P-51 Mustang, an F7F Tigercat, T-6 Texan, and a T-28 Trojan.